Asteroid 2017 DQ15 is a NEO (Apollo) displayed in the list of objects with a comet-like orbit maintained by Y. Fernandez. 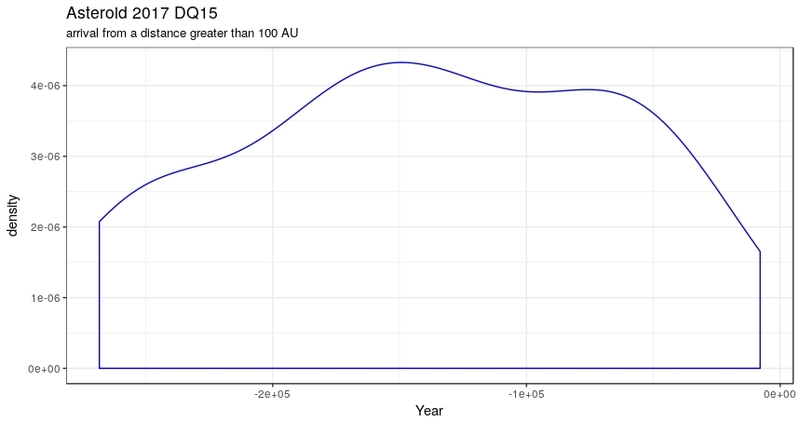 Based on the nominal orbital parameters and uncertainty, I generated 100 clones with an R script and then I used the Mercury6 simulator by J.E. Chambers to investigate what happened in the last 10^8 days. More about the program "A Hybrid Symplectic Integrator that Permits Close Encounters between Massive Bodies'' can be found here. As seen above, the "ejection distance" used to claim that an asteroid has arrived from the outskirts of the solar system is 100 AU. The most recent arrival time was about 7906 B.C. The mean arrival time was about 139274 B.C. The less recent arrival time was about 268318 B.C.